Interstate 70 has an array of active business loops and spurs between Utah and Missouri. Several of them are unsigned in Colorado. Mileage statistics for the Colorado business routes cited below were obtained from the CDOT – Straight Line Diagram Tool. The routes are inventoried with a suffix. Route 070A is the Interstate 70 mainline. Route 070Z is one half of the Grand Business loop couplet along Ute Avenue. 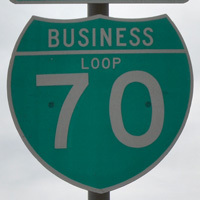 Business Loop I-70 follows Utah 120 through Richfield between Exits 37 and 40. 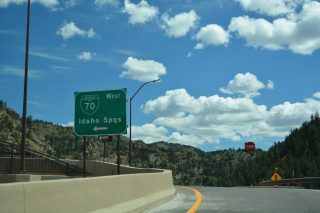 It is signed with trailblazers “To Interstate 70 and U.S. 89” or as Utah 120, but the typical business loop signs are generally not posted other than at the interchanges. Beginning from Interstate 70 at Red Hills Drive (Exit 37), Business Loop I-70 travels east along West 1300 South until meeting Utah 118. At that intersection, Business Loop I-70 and Utah 120 turn north along with Utah 118 via Main Street. The routes divide at the intersection with East 300 North, where Utah 118 turns east and Business Loop I-70 and Utah 120 proceed north. The route ends where Main Street meets I-70. It is important to note that the business route does not completely overlap old U.S. 89, since U.S. 89 used to follow the route of today’ss Utah 118 through much of the Sevier Valley. 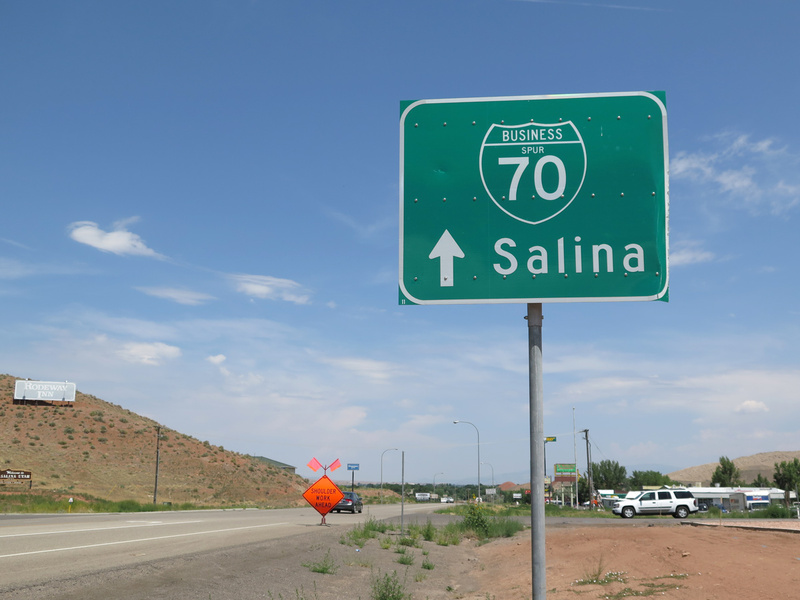 Cosigned with U.S. 50 & 89, Business Spur I-70 connects Interstate 70 with the city of Salina north from Exit 54 via State Street. The 1.8 mile route is signed with a handful of shields to the four-way stop where U.S. 50 and U.S. 89 separate at the city center. From Exit 54, U.S. 50 and U.S. 89 split, with U.S. 89 traveling southwest along with Interstate 70 toward Richfield and U.S. 50 traveling east toward Grand Junction, Colorado. Green River provides an array of traveler services along an otherwise desolate stretch of Interstate 70 between Salina, Utah and Grand Junction, Colorado. The city also acts as a waypoint for tourists headed southeast to Arches National Park. Business Loop I-70 & Utah 19 constitute the main route through the city as they arc north from I-70 along Main Street (old U.S. 6-50-191) between Exits 158 and 162. U.S. 6 splits with Business Loop I-70 & U.S. 50 via North Avenue east along an older bypass route to Colorado Mesa University and Lincoln Park. The business route and U.S. 50 continue southeast and circumvent Downtown along 1st Street and the couplet of Pitkin Avenue (east) and Ute Avenue (west) to their separation at South 5th Street. U.S. 50 departs Grand South across the Colorado River to Orchard Mesa while Business Loop I-70 travels solo east to become a controlled access arterial. U.S. 6 and Business Loop I-70 reconvene ahead of 30 Road and overlap once again eastward to F Road at Clifton. U.S. 6 stays south of I-70 to Palisade while the business loop (Route 070B) concludes a 13.265 mile route at a trumpet interchange (Exit 37). 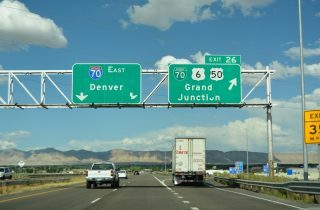 The Palisade business route for I-70 was referenced solely on guide signs posted along Interstate 70 west for the wye interchange at Exit 42. The remainder of the route was posted as U.S. 6. The implied west end was Elberta Avenue north to Exit 44.
Business Loop I-70 at the city of Rifle overlapped with U.S. 6 east from Exit 87 to SH 13 (Railroad Avenue) and with SH 13 south across the Colorado River to Exit 90. The four mile route was unsigned in 2004 and possibly already decommissioned by that time. Inventoried as Route 070E by CDOT, the unsigned business spur from I-70 links Exit 97 with the town of Silt. The 0.222 mile route lines 9th Street north from the adjacent South Side Frontage Road to a roundabout with U.S. 6 (Main Street). Business Spur I-70 connects I-70 with the town of Eagle at Exit 147. The 0.346-mile route navigates through a series of four roundabouts from the north side ramps with Interstate 70 south to U.S. 6 (Grand Avenue). 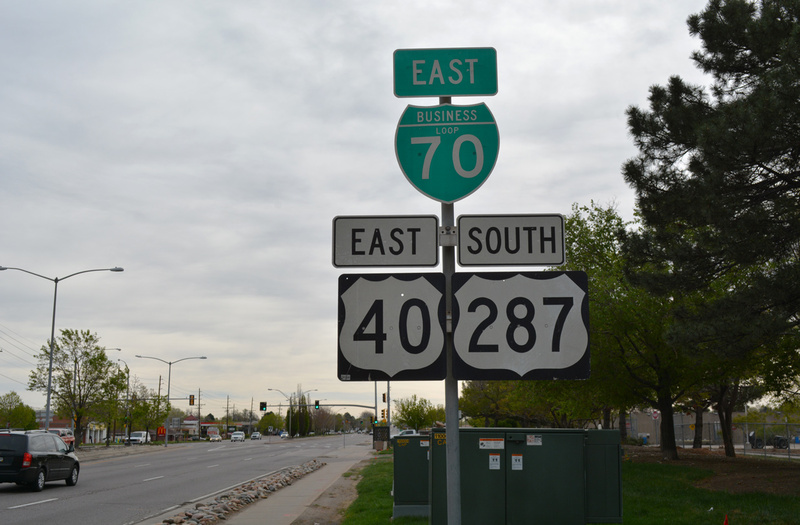 The unmarked spur is considered a major collector by CDOT and designated Route 070F. 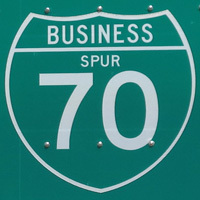 Business Spur I-70 is Route 070G, a 0.577 mile link from Interstate 70 to U.S. 6 in Edwards. The unsigned route follows Edwards Access Road northeast from U.S. 6 across the Eagle River to roundabouts at Miller Ranch Road and within the dumbbell interchange (Exit 163) at I-70. The Avon business spur for I-70 used to extend 0.43 miles south from Exit 167 along Avon Road to U.S. 6. It was eliminated in 1999.<sup>2</sup> The former route sees five roundabouts now, including two at the dumbbell interchange with Interstate 70. Route 070K follows Colorado Boulevard (old U.S. 6 & 40) for 2.711 miles through the valley city of Idaho Springs. The business loop parallels I-70 just to the north, from a wye interchange (Exit 239) east to the city center and Exit 241 at Idaho Springs Road. Business Loop I-70 crosses the Denver metropolitan area between the city of Golden to the west and Aurora to the east. According to the Denver Rocky Mountain News from June 19, 2000, Colfax Avenue is “the longest continuous commercial thoroughfare” in the United States. The business route follows all of Colfax Avenue, and it is cosigned with U.S. 40 throughout and with U.S. 287 east from Federal Boulevard. Business Loop I-70 is not acknowledged from Interstate 25 when it crosses paths with Colfax Avenue near Downtown. The 27.47 mile route of Business 70 is one of the longest in the country. It is not inventoried independently by CDOT since it overlaps with state maintained sections of U.S. 40 and 287.
Business I-70 at Exit 259, unmarked from the I-70 mainline. Business Spur I-70 (Route 070L) links I-70 & U.S. 36-40-287 with SH 36 (Colfax Avenue / U.S. 36-C per CDOT) at the community of Watkins. The 0.400 mile route is signed from the freeway mainline as it runs north along Watkins Roads from Exit 295. Guide signs and shields for Exit 295 reference Business Loop I-70 instead of Spur. This unsigned business spur (Route 070M) joins I-70 & U.S. 36-40-287 with SH 36 (inventoried as U.S. 36-D) at unincorporated Strasburg. The 0.348 mile route connects Exit 310 with 15th Avenue along Wagner Street. Route 070N is defined as from U.S. 40-E in Deer Trail northeast to I 70-A. The 0.396-mile joins Interstate 70 & U.S. 40-287 with SH 40 via Cedar Street and Exit 328. Main Street west from Exit 340 to 1st Avenue (old U.S. 40) represents the 0.353 mile long unsigned Business Spur I-70 (Route 070O) at the rural community of Agate. Business Loop I-70 at Limon intertwines with Interstate 70 between Exits 359 and 361. The route doglegs southeast via unsigned U.S. 24 Spur and U.S. 24-40-287 (Main Street) across the south side of Limon. A diamond interchange joins the four highways at Exit 361 and Limon Municipal Airport (LIC). East from there, Business Loop I-70 curves south to meet I-70 again as U.S. 40 & 287 depart the freeway corridor for Hugo. Business Spur I-70 leads north 0.528 miles from Exit 412 to U.S. 24 (North Street) at 1st Avenue in the rural town of Vona. Guide signs for Route 070P reference “Vona” alone. The Burlington business route for I-70 comprises a 1.97 mile2 loop from Exit 437 along U.S. 385 (Lincoln Street) north to Rose Avenue (U.S. 24) east to Exit 438. The 0.24 mile section of Rose Avenue east from U.S. 24D and 6th Street to CR 49 just beyond I-70 is inventoried as a business spur and Route 070Q. As of 2012, guide signs on I-70 reference the business loop for U.S. 24 (Rose Avenue) west and U.S. 385 (Lincoln Street) north. The route appears to be unsigned along U.S. 24 and U.S. 385 otherwise. As proposed by Kansas to AASHTO in 1979, the business route for I-70 at Goodland would follow a three mile loop between Exits 17 and 19. The loop was outlined as following K-27 north to Old Highway 24, where it would turn east over K-27 Spur (old U.S. 24) across south Goodland. Like all of the requests for Interstate Business Routes that year, the Goodland loop was disapproved on October 13th. U.S. 24 Business was eventually posted as a substitute. Traveling 11.3 miles, Business Loop I-70 overlapped with U.S. 24 east from Exit 45 near Levant to K-25 in Colby and south on K-25 back to I-70 at Exit 53. The route was submitted to AASHTO in 1979 and subsequently disapproved on October 13. Brian O’Neill reported that the route was signed nonetheless as it ran north along Range Avenue (K-25) to the city’s old high school and west along 4th Street (U.S. 24). A remaining shield was still posted on K-25 southbound by Thomas County Speedway in 2007. Webmaster of Kansas Highways, Richie Kennedy recalled a business route for I-70 posted through Oakley on U.S. 83 south from Exit 70 to U.S. 40 east and Exit 76. This route was eventually eliminated, and disapproved by AASHTO on October 13, 1979. The proposed route sent to AASHTO called for the I-70 business route to run in tandem with U.S. 83 south to the city center along the Union Pacific Railroad tracks to 8th Street east and Center Avenue south. U.S. 83 then dog legged southeast from Center Avenue along Front Street and Freeman Avenue to intersect U.S. 40, which had already bypassed the city along a four lane highway to the south. U.S. 83 was later realigned to bypass Oakley to the west. The 2.3 mile business route for I-70 at WaKeeney was submitted to AASHTO and in 1979. The route would have connected the city center with Interstate 70 from Exit 127 by way of an overlap with U.S. 283 along 1st Street north and Barclay Avenue to the west. The east side of the loop would branch south from U.S. 283 and Barclay Avenue along 13th Street to I-70 at Exit 128. Ultimately disapproved by AASHTO, the route was alternatively marked as U.S. 40 Business. According to Brian O’Neill, as late as 1985, a marked Business Route I-70 was located in Hays. Trailblazers for the loop followed U.S. 183 from Exit 159 south to 8th Street (old U.S. 40 / City U.S. 40), then west and northwest to rejoin I-70 by way of U.S. 183 Bypass at Exit 157. Kansas submitted the I-70 business route for Hayes to AASHTO for approval in 1979. The business loop proposed for the city of Russell involved a 6.5 mile route north from Exit 184 along U.S. 281 (Fossill Street) to Wichita Avenue and old U.S. 40 southeast back to I-70 at Exit 189. Disapproved by AASHTO on October 13, 1979, the alignment was posted as U.S. 40 Business. This proposed business route for I-70 would have run north along U.S. 40 & 77 Alternate on Washington Street in Junction City to 6th Street (U.S. 40 Alternate) east to Grandview Plaza. The 4.1 mile loop would begin at Exit 296 and end at Exit 300. It was disapproved by AASHTO on October 13, 1979 and instead designated as U.S. 40 Business. Business Loop I-70 overlays U.S. 40 and Missouri 5 (Ashley Road) northeast from Exit 101 to Main Street in Boonville. Missouri 87 (Bingham Road) angles the route southeast from Main Street and U.S. 40 back to I-70 at Exit 106. The route is a local designation as it is not inventoried on the MDOT HP Maps viewer. 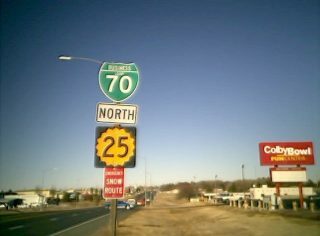 The city of Columbia signs this stretch of old U.S. 40 as “Business Loop 70,” even though it is also known as Mores Boulevard. Moreover, the city naming extends west from Exit 125 to Stadium Boulevard, north of the I-70 DDI at Exit 124. Old Bypass U.S. 40, Business Loop I-70 follows First Capitol Drive and Fifth Street between Exits 228 and 229. 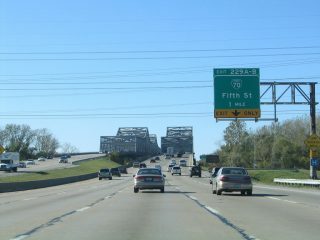 U.S. 40 follows a freeway along side both Interstate 64 and U.S. 61 from Wentzville southeast through St. Charles County. 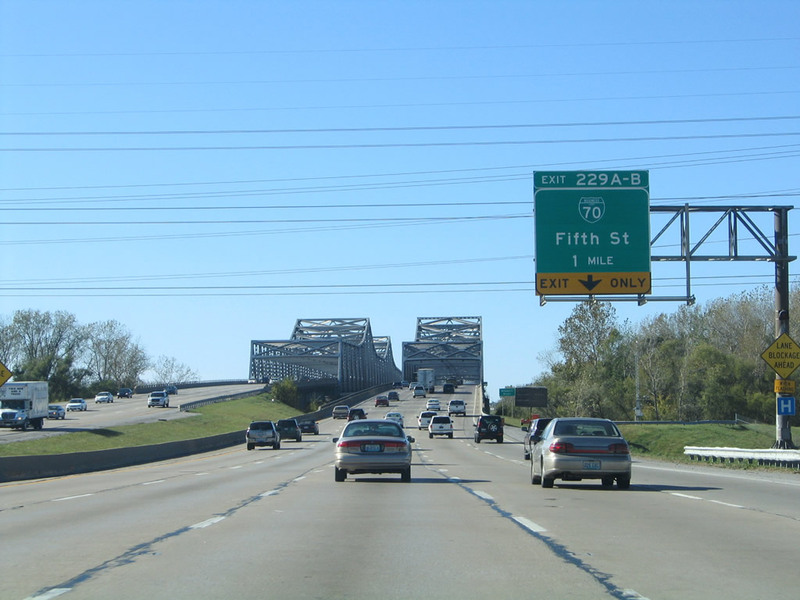 U.S. 40 Bypass was replaced by Interstate 70 (Mark Twain Expressway) east from Wentzville to Bridgeton, and Interstate 270 east from I-70 to Illinois. According to a Rand McNally Map of St. Louis from 1964, Business Loop I-70 in St. Charles once followed West Clay Street east from the U.S. 40 Bypass transition into the Mark Twain Expressway (present day Exit 227) to 2nd Street north and the Missouri River Bridge of Highway 115 across the Missouri River. The bridge was closed on December 29, 1992 and demolished in 1997. Within St. Louis County, the route followed St. Charles Rock Road to a conclusion at Interstate 270 (Exit 20A), just north of I-70. Toward the end of the 1960s, Business Loop I-70 was redefined to cosign with Missouri 94 east from Exit 228, and 5th Street south from Downtown St. Charles. The lone business route east of the Mississippi River for Interstate 70 traveled a 15.4 mile long linear route through the city of Springfield. Since signs were sparsely posted, the implied route of Business Loop I-70 followed the Ohio 4 expressway northeast from Exit 47 to U.S. 40 (Main Street) on the western outskirts of the city. U.S. 40 continued the route east as an urban boulevard (Park Road) to a one-way couplet consisting of three eastbound lanes along Columbia Street and three westbound on North Street. Remaining shields for Business Loop I-70 across Springfield included tri-color markers westbound after I-70 in 2008 and on both directions of U.S. 40 at Bird Street in 2015. Standard shields for BL I-70 stood along U.S. 40 (Columbia Street) eastbound ahead of the Spring Street (SR 72) overpass and westbound at Foster Street in 2011. Beyond SR 72, trailblazers for I-70 take the place for Business Loop I-70 west along U.S. 40. Interstate 270 Spur in Maryland is one of four Interstate spurs designated my the Maryland State Highway Administration (MDSHA). Others include I-495X (Cabin John Parkway) south from Exit 39 in suburban Washington, and I-895A and I-895B, connectors linking the Harbor Tunnel Thruway (I-895) in Baltimore with I-97 and MD 2 respectively. These routes are all unsigned for the most part. Interstate 270Y, per MDSHA documents, is a 2.1 mile long freeway spur in suburban Montgomery County. 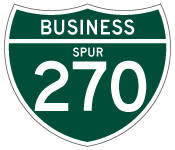 Not a traditional business spur, I-270 Spur is merely the southwestern branch of Interstate 270 connecting the mainline with the Capital Beltway (I-495). This heavily traveled route was previously signed with “spur” banners positioned above I-270 markers, but is essentially unsigned now with the exception of a single reference on a southbound I-270 overhead. The freeway was signed as I-270 when the mainline from I-495 northwest to Frederick was designated Interstate 70S. This changed in 1973. 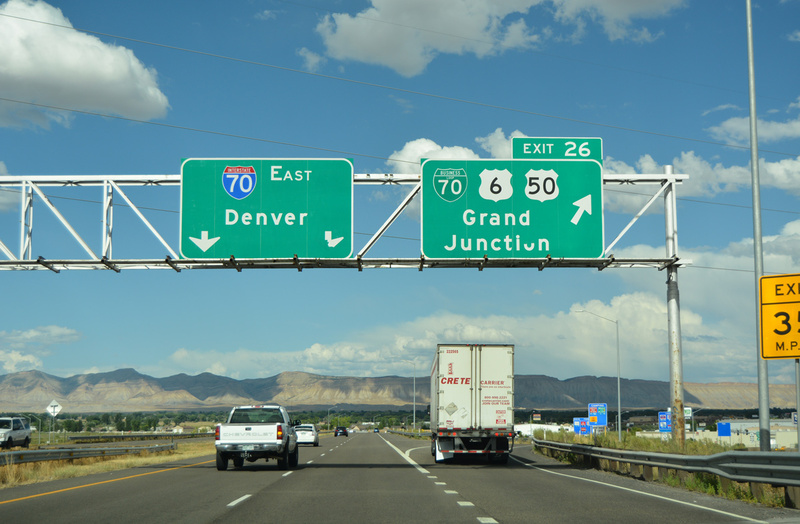 “CDOT, City of Grand Junction Partner on State’s First Diverging Diamond Interchange.” Colorado Department of Transportation, news release. July 12, 2013. “Exit 241 Reconfiguration.” I-70 Mountain Peak Period Shoulder Lane Project web site (CDOT). Email correspondence with Matt Salek. Email correspondence and field observations from Harrison Page, and references to a Fred F. Johnson map of Springfield displaying Business Loop I-70 along SR 4. Page updated April 19, 2017. Interstate 70 east at the split with U.S. 50 and the Grand Business loop. Photo taken 08/10/16. Business Loop I-70K leads west back into Idaho Springs from Interstate 70 at Exit 241. Photo taken 08/11/16. 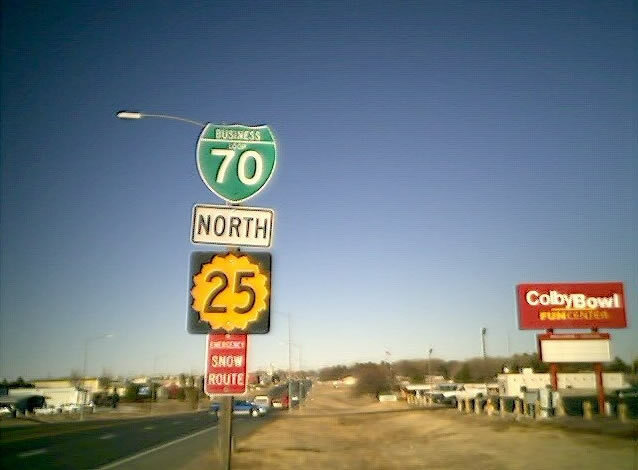 Reassurance markers for Business Loop I-70 west & K-25 north after College Drive on Range Avenue north in Kolby, Kansas. The I-70 shield was removed by 2009. Photo taken by Brian O&apos;Neill (12/29/03). Interstate 70 westbound on the approach to the St. Charles, Missouri business loop. Photo taken 10/16/04.